Like most vets, Heidi wanted to be a vet from a very early age, when she thought that she would get taught how to speak “animal”. Her journey took a little longer than most due to personal circumstances she started her work career being a full time shop assistant, and ended up working in finance being a financial accountant for a stock broking firm in London. At the age of 27 she then studied her A levels, while working full time, got accepted into Bristol University for Veterinary Science, and not looked back since! 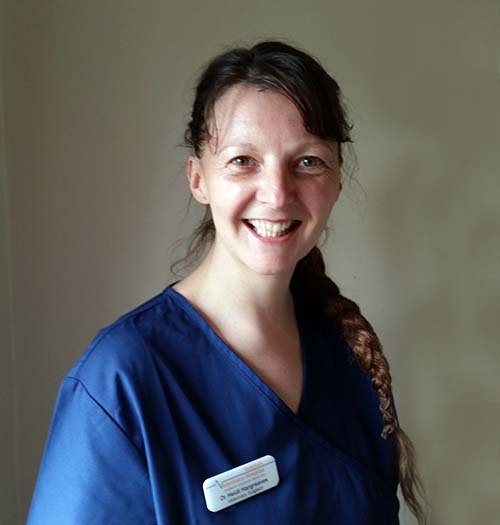 Heidi’s veterinary interests vary widely from acupuncture, behaviour, exotics, medicine and emergency surgery. She looks forward to doing a specialisation certificate one day, once she decides which one to start first! Heidi and her husband live in their own bungalow, on the Somerset levels enjoying all the wildlife. When not exploring the local attractions, or doing conservation projects, she enjoys being trained by their little Noah’s arc which includes Poppie a collie, Charlie and Louie two mischievous cats, lots of fish and Princess the bat.